I’ve been to Sissinghurst today, so am spoilt for choice when it comes to spring sweeties to feature as flower candy. Sorry to disappoint, but I am going to resist temptation and save Sissinghurst’s treats for another occasion. Instead let me introduce you to Tulipa ‘Czar Peter’, a gregii tulip that’s currently flowering in our coastal garden. The gregiis originate from Central Asia where they grow on mountain slopes, hence they are hardy, naturally compact and well suited to cultivation in containers. Mine are densely planted in a large, glazed stoneware bowl that sits in the middle of our garden table. The Czar, so far, is proving a little schizophrenic. His buds emerged pale and bosomy (please excuse my choice of adjective, but it’s an apt one), sitting proudly above the red striped foliage that all gregiis share. Given a spell in the sun the flowers have opened buttermilk yellow with painterly scarlet markings. The contrast is dramatic, highlighting the poor choice I made in matchmaking the Czar with ice white cyclamen, which have suddenly decided to turn candy pink. No matter, the Czar is definitely the star. 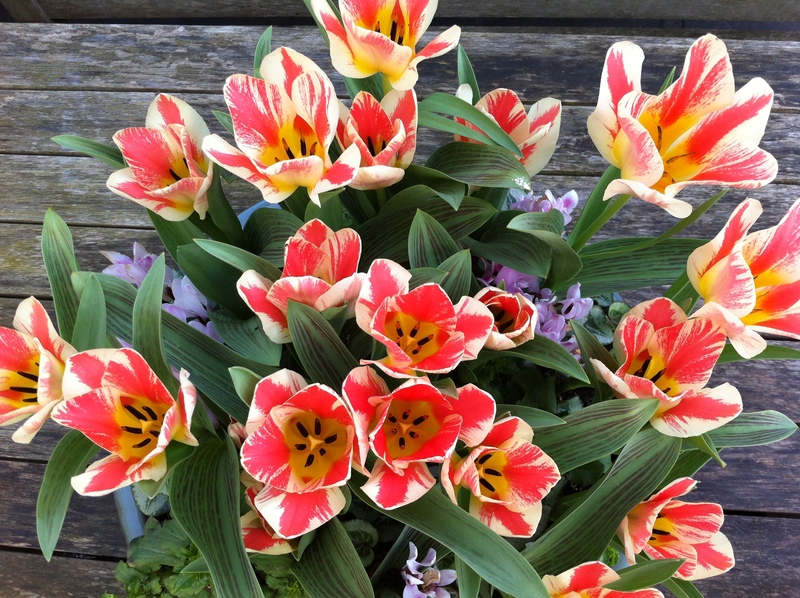 Tulipa ‘Czar Peter’ is available from Avon Bulbs from September. ‘Czar Peter’ is such a gorgeous colour, and what a fab weather for a visit to Sissinghurst, looking forward to the report. Hi Helen. Sissinghurst looked beautiful, but by the time you come it should look even better. The countryside around and about was covered in a green haze of emerging leaves. Our spring has arrived ridiculously early this year – it feels more like May did last year. I am really looking forward to our garden road trip and, of course, to Chelsea, which is already being hyped up here. Enjoy that chardie – it’s a bit early for me to join you here in the UK! How are those baby alpacas? Sissinghurst? You certainly get around. I love this Tulip, it is stunning both in bud and full bloom. I’m not sure that Czar Peter the Great, Emperor of Russia and fearless soldier would appreciate being called ‘bosomy’ though. Still, he’s not around to complain. Exactly my thinking. He didn’t get to choose the tulip in the first place. I think he’d have gone for something deep red or purple – way more regal! 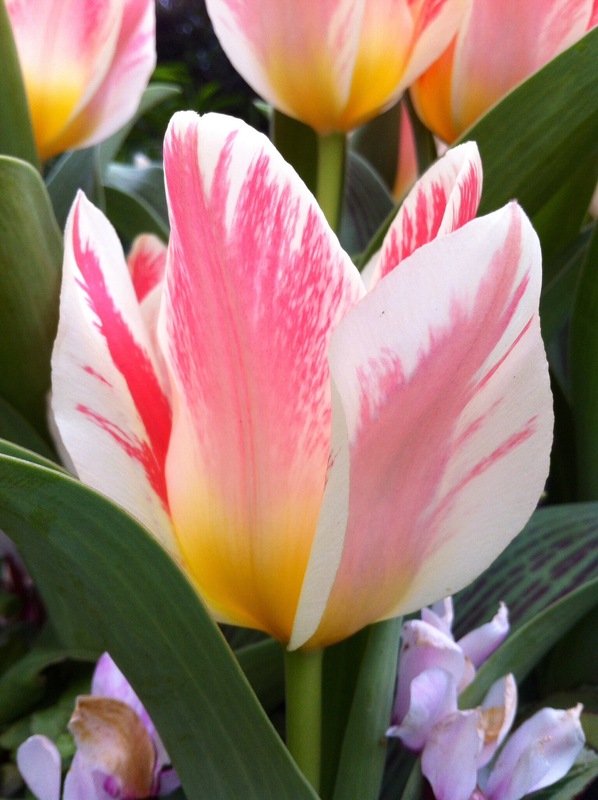 The Czar is truly spectacular and I love striped tulips. This beautiful bouquet lifted my spirits today.